Microbial denitrification is the primary driver of nitrogen losses from the plant-soil system and the key process for the closure of the global N cycle. All major controls of denitrification might be directly or indirectly affected by plants. However, there is a lack of research of the direct effects of plants on soil denitrification and how this effect might be mediated by soil properties. This study assesses the effect of three common crop species and two agricultural soils on denitrification potentials. 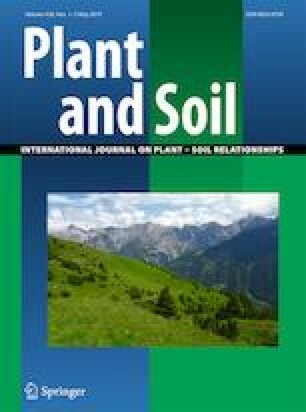 We conducted a factorial experiment under controlled conditions to analyze the effects of (1) different plant species (barley, wheat or ryegrass), (2) two different soils (texture/ SOC) and (3) two different soil moisture levels on Denitrification Enzyme Activity (DEA) in bulk and rhizosphere soil. The SOC richer clay loam soil showed on average higher DEA (+81%) compared to the SOC poorer silty loam soil. All three plants were found to stimulate denitrification with significant differences between certain species: rye grass (+92% ± 14%) ≥ barley (+75% ± 26%) ≥ wheat (+50% ± 19%). DEA in agricultural soils is interactively controlled by plant species and soil type with an overall stimulating effect of plants on the denitrification potential. Future research should focus on disentangling single mechanisms of plant control on actual denitrification rates and N gas product ratios. The online version of this article ( https://doi.org/10.1007/s11104-019-04038-5) contains supplementary material, which is available to authorized users. We gratefully acknowledge Daniel Maurer, Anja Schäfler-Schmid, Tatiana Rittl, Julia Pazmino Murillo, Robin Jahn and Madeleine Nicolas for help during laboratory work, preparation of the setup of the experiment, and/or suggestions on writing. Data of the soil properties were provided by DASIM (Denitrification in Agricultural Soils – Integrated control and Modelling) research unit. We thank the German Science Foundation for funding our work through the research unit DFG-FOR 2337: DASIM.